Comments: Evergreen broadleaf native to subtropical South Africa. 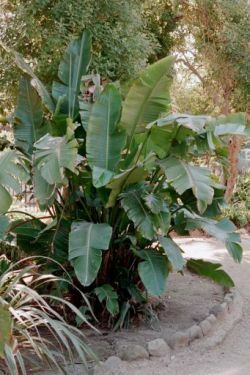 Palm like when mature, this plant has large green leaves which look like feather fronds without the regular leaf divisions. A large white flower with a blue beak-like horizontal projection gives this plant its name. The plant is not frost tolerant and will die back in cold winters.